My latest review is published. For those of you that don't receive the magazine here's a link to their online publication. This is what I use to record the NerdUp Podcast. 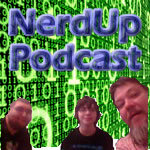 NerdUp Podcast: Episode #24 "The Testament of Arkadia"
Episode #24 "The Testament of Arkadia"
The entire cast of the NerdUp Podcast get together to discuss all things nerdy. Gil T. & Isaac discuss "The Lego Movie," and then each person with their specialty joins in and lead up to an hour of perfect nerdiness. Eric Billingsly the TV & movie nerd, Brandon Bell the DC comics nerd, Isaac the video game nerd and all headed up by the nerd Ringleader, Gil T. Wilson. Topics discussed include Sherlock, Marvel Avengers Alliance social game, Walking Dead, Gaming of Thrones, Carnage U.S.A, Superior Spider-Man, Man of Steel, Justice League, Marvel Agents of SHIELD and lots more stuff. NerdUp Podcast: Episode 21 "The Infernal Machine"
In this thrilling episode Gil T. & Shawna talk about "Wreck-it Ralph," "Here Comes the Boom" Robinson, Il Nerd Day, Marvel Avengers Alliance Social Game, Batman No Man's Land, Jim Butcher's latest tale from the Dresden Files "Cold Days" and other nerdy things. True Hideaway Geeks episode #21 "The Guilty Alibi"
In this week's installment of True Hideaway Geeks Podcast Gil T. & Shawn have a very special Halloween episode, not after school special special, just very Halloweeny. We discuss the movie "Silent Hill Revelations," "Walking Dead," scary video games, "Arrow," Scary movies, marvel avengers alliance.